After finishing 80-82 last season, a 14-game improvement from the previous year, the Philadelphia Phillies were one of the most aggressive teams in free agency this winter. In addition to signing Bryce Harper, the Phillies made several other notable moves to improve their roster for the short-term. But will those additions be enough to make Philadelphia a contender in 2019 or will the Phillies fall short of the suddenly massive expectations? Philadelphia’s rotation was in the bottom-third of the National League in ERA last year. However, it will look largely the same as it did in 2018. The five pitchers who all made at least 24 starts last year are all back in the fold. The main difference is that now Aaron Nola is the undisputed ace after winning 17 games and finishing third in the Cy Young voting last year. The Phillies are hoping that he and Jake Arrieta can serve as duel aces after Arrieta had a solid but unspectacular 2018 season. The key for the Phillies will be the continued development of their youngsters in the back-end of their rotation. Nick Pivetta, Zach Eflin, and Vince Velasquez all turned in solid seasons in 2018. However, one or more of them will have to take a significant step forward if the Phillies want to have a rotation that can match up against the elite rotations in the National League. The Phillies are also hopeful they can get a little more out of Jerad Eickhoff, who registered a 3.65 ERA in 33 starts in 2016 but was limited to just one start last year by injury. The Philadelphia bullpen was also a touch below average last year, so some improvement will be needed. For that, the Phillies signed David Robertson over the winter. Robertson hasn’t seen much time as a closer the past couple of seasons, but he could find himself in that role in Philadelphia. Both Hector Neris and Seranthony Dominguez have spent time as the closer, but Neris had a dreadful 2018 season and Dominguez has just one year in the big leagues under his belt. 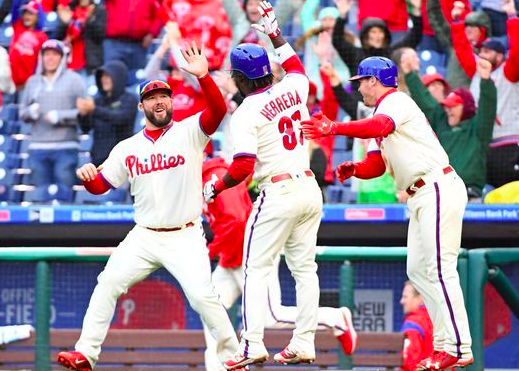 The Phillies may be more comfortable letting those two start out in setup roles alongside veteran Pat Neshek while Robertson handles the pressure of the 9th inning. The good news is that the Phillies should have some good depth in their bullpen. Both Tommy Hunter and Adam Morgan were reliable middle relievers last year. Veteran Juan Nicasio could also help in that role if he can bounce back from a troublesome 2018 season. Edubray Ramos and Victor Arano both showed a lot of promise last year and could become mainstays in the Philadelphia bullpen this season. The Phillies also traded for James Pazos and Jose Alvarez over the winter. Despite a lack of proven late-game relievers outside of Robertson and Neshek, the Phillies could see improvement in their bullpen due to an impressive amount of depth. Offensively, it’d be shocking if the Phillies didn’t take a big leap forward. Obviously, Harper will anchor the lineup alongside Rhys Hoskins, who hit 38 home runs last season. Odubel Herrera and Maikel Franco are also proven commodities who each hit 22 homers last year. More importantly, the Phillies made a huge upgrade at catch both offensively and defensively by trading for J.T. Realmuto. He can help give some protection to Harper and Hoskins while making Philadelphia’s lineup even deeper. Two more offseason additions who shouldn’t be overlooked are shortstop Jean Segura and outfielder Andrew McCutchen. Segura will team up with Cesar Hernandez to give the Phillies speedy table setters at the top of the lineup. Meanwhile, McCutchen will join Aaron Altherr and promising youngster Nick Williams in giving Philadelphia a deep and talented outfield that’s almost overcrowded with the late addition of Harper. The Phillies will have another promising talent in Scott Kingery to be their main backup at all of the infield positions. Everyone is expecting big things from the Phillies this season. On paper, they certainly appear to have the upside of a team that can contend for a World Series title. However, their young starters in the back-end of their rotation still have to take a step forward, and their young arms in the bullpen have to prove they can be consistent from one year to the next. In short, there’s still a lot for this team to prove. Look for the Phillies to slug their way to a 90-72 record, giving them a puncher’s chance to win the NL East.